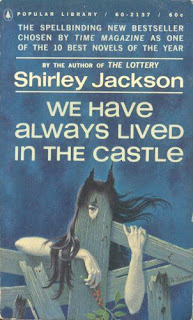 For the October meeting of City Lit's Weird & Wonderful book club, we discussed We Have Always Lived in the Castle by Shirley Jackson. A superb horror/psychological thriller, the novel follows the survivors (and perpetrators) of a terrible crime years later. Brief notes and possible spoilers below. 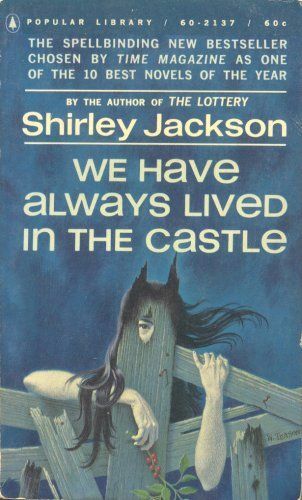 First, we talked about covers: some we loved, some we hated. Joan's (pictured above) is best. Initially talking about how we rated it, we got in a digression about Goodreads/Netflix/etc. star-rating systems and how we approach them. Some folks "start at 5" and then subtract, others "start at 0" and then add, others try to work iwth some kind of comparative baseline...fascinating stuff. Talked about the "Lottery Expectation" issue, where folks who've only read Jackson's The Lottery compare anything else to that. Generally agreed that all of her stuff is very good, but The Lottery is so good, so condensed, and so widely-read that it kind of sets an unfair bar. Lot of questions about what (if anything) Merricat's family did to her. The Twist and whether we saw it in advance or not. A lot of talk about how this is "from the viewpoint of the abuser in an abusive relationship", and how that skews everything. "How old is Merrikat really, inside?" A lot of discussion about Stockholm syndrome in connection to Constance & Merrikat's relationship. Several film & play adaptions of this. On adaptions and how they fail even when faithful, Harry Potter brought up: "I don't want to see quidditch on screen." Agoraphobia and claustrophobia, how well this novel conveys the feeling of boundaries closing in. Relation to Jackson's personal psychological issues. I was also strongly reminded of Cortazar's story House Taken Over. Mobs and bullying, how those dynamics work. We thought both the more extreme actions here (the mob action at the fire) and the aftermath both seem believable. Comparions to the film Dogtooth for the insular family relations. Lots of praise for the uncanniness here, the way this is a completely non-supernatural horror. Praise for The Haunting of Hill House and the original film adaptation. Disconcerting things notwithstanding, we liked being able to really buy into the female lead. We have a member from Jackson's hometown outside of Rochester, NY; talked for a bit about how Jackson's impression and relationship with her town colors the novel. Highly recommended the Mallory Ortberg's Lottery/Gilmore Girls mash-up (as well as everything on the Toast, to be honest). Lot of talk about cousin-marrying acceptability: the Haupsburgs, that one 30 Rock episode, that one X-Files episode. We liked some of the OCD, boundary-establishing, talisman-magic kind of stuff going on here. Family preserves collection led to an aside on pickling, canning, and the world's oldest butter. That twitter thread about horror house. An aside on fidget spinners! The documentary Grey Gardens mentioned for real-world similarity; it's also turning into a musical and was parodied in Documentary Now. Great book, great discussion. We also got into a lot of talk about editing, writing, & self-publication, including Robyn Carney's The (Un)Wanted Guests. For next time, we're reading White Noise by Don DeLillo, and in January we're reading Dawn by Octavia Butler. Weird & Wonderful clubs and many other wonderful events can be found on the City Lit Books website.